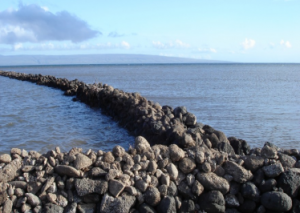 How can Moloka‘i’s traditional fishpond managers prepare for climate change? This project brings together Hawai‘i’s climate change scientists, Moloka‘i’s traditional fishpond managers, and other natural resource managers to share scientific and cultural knowledge and work together as a team to identify adaptive management strategies for two of Moloka‘i’s ancient fishponds. This is accomplished through a series of workshops, the results of which will be incorporated into the strategic plan for the ponds and upland areas, inform the island’s K-6 curriculum, and create a “community engagement protocol” to help climate scientists work with other communities throughout Hawai‘i and the Pacific.